We're raising some meat birds. These are Cornish-Cross chicks, a hybrid chicken that gains weight with a speed and seriousness awesome to behold. They're darling little balls of fluff right now, but in eight weeks (literally) they'll be grotesquely huge and ready to butcher. 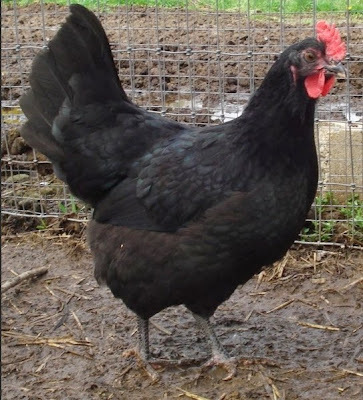 This breed is the standard meat breed of chicken you'll find in grocery stores across the country... but they can't be bred true because they won't live long enough to reproduce. As they get older, they get so heavy their hearts give out, and their legs give out. It's kinda freaky, really. 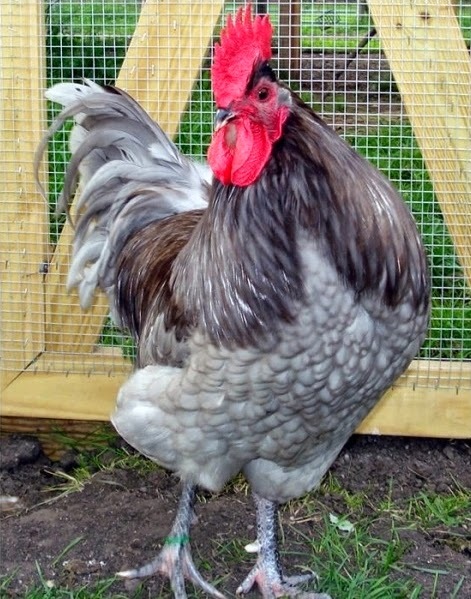 While many other breeds of chickens are "dual purpose" (eggs and meat), Cornish crosses are single-purpose: meat only. Other common chicken breeds are fine to eat, but don't produce the lovely huge roasting chicken-size birds. Don and I started wondering -- can we breed Cornish Crosses? Turns out they have a rather complicated tangle of genetics that precludes the home breeder from duplicating the exact lineage that produces these dedicated fast-growing birds. So instead we're going to take a different approach. At some point in the future we're going to start a parallel flock of birds ("parallel" meaning we'll try to keep the flocks separate to discourage cross-breeding) of Jersey Giant chickens. These are a true breed which is considered "heritage" (rare). The males reach about 14 lbs., the hens about 10 lbs., extremely respectable sizes for butchering. In fact, Jersey Giants used to be the standard bird for the meat industry, but when Cornish Crosses came into popularity, Jersey Giants fell out of favor. Jerseys take nine months to get to butchering weight; Cornish Crosses only two months. You can see the advantage to the meat industry to switch to Cornish Crosses. But we'd rather be in a position to raise our own broilers without having to depend on outside sources to provide the chicks, so Jersey Giants look like a good choice for us. Besides their size, Jerseys are known for two additional characteristics: their dependability for laying during winter months (when many other chicken breeds fall off) and their sweetness of disposition. And their bodies won't fall apart like the bodies of Cornish Crosses, so we can keep a breeding flock indefinitely. Apparently the hens are so heavy, however, that they've been known to break eggs as they brood them, so we'll have to incubate eggs to get chicks (not a problem for us). Jersey Giants come in three colors: white, black, and "blue." The blacks are larger, so we'll start with blacks with maybe a few blues thrown in for fun. Half the fun of a homestead is experimenting with new things. I'm looking forward to when we can build the facilities to house our parallel flock and order some Jersey Giants! SwampMan and I raised the Cornish crosses before and did not like them though, in retrospect, those twisted bones may have been because the local feed stores did not have an adequate high protein chick feed for their rapid growth. Now we eat the excess roosters that are hatched out around here. The White Rocks, Araucanas, and Rhode Island Reds (and crosses thereof) produce a carcass plenty big enough for us. For folks with the room that like a food source that grows quickly with a little supplemental corn, I highly recommend Muscovy ducks. They're great foragers, will keep mosquito populations down, and are prodigious egg layers, as well. There's a l lot of valuable info in this post as hubby and I get closer and closer to making the "chicken jump." We've started a mental round-up of what supplies we already have - the coop, a big kennel, etc, Now I can use this information to add to my folder. Jersey Giants. I like it. Will you eventually switch to the Jersey Giants and replace your existing laying flock? It is fun to learn new things. It looks like you are increasing your ability to produce your own food. Good for you. I've read about the Cornish-Cross...I really can't believe something growing that fast. I thought my Plymouth Rocks grew fast, being able to see week-to-week differences. I have to believe that you will almost be able to see the Cornish's growing as you watch. One day I'll have some chickens. It looks like fun and I can't help but think it'd be a learning experience for 9yr old; on many levels. This is my first year to raise cornish crosses. I took the first 5 to the Amish woman who butchers for me (her doing this is a win for me!) and they were bigger than the bags she usually puts birds in. yikes. I have 24 more of them to go. I have lots of baby roosters that will get butchered this fall, and I am trying to psych myself up for doing a bunch of the older hens (but they are all my favorite). I got my husband (haha, as much for me!) a grill/roaster/smoker (the Big Easy by Charbroil, not an ad) for Father's Day. LOVE it. We brined a CC and a mutt rooster and they were both delicious and tender. I haven't had roasted chicken for years as I thought they'd be tough. I wait for cookstove season and simmer them. Anyway, I had white JG and loved them so definitely give them a try. (not black because I don't like picking pin feathers) We saved one rooster to be the Stud for the broody hens the next year. That was a great experiment result. Sounds like fun! Especially since you have much, if not all, of the infrastructure in place. I've eaten cornish crosses from a local homeschoo kid who raises them for $$. Last year we raised Red Rangers for meat. We wanted a bird that did well free ranged instead of fed. They were ready to butcher in 90 days. Not as big as CCs, but big enough that this family of four found one to be enough supper when roasted. The roosters come out a couple pounds heavier than the hens, but we are getting only hens this year (tomorrow actually) because the roos were a pain to our laying hens. FWIW, this year we will have 24 chickens to go with the 13 ducks already in the freezer. Next year, I'd like to reverse the numbers, because we all prefer duck meat. Just love the Jersey Giants - beautiful, friendly birds. Guess what? They are very, very popular here in Jersey! And they tolerate our cold winters very well. Their eggs are quite large and the roosters are usually docile. My only concern is with the Jersey Giants comb. The have a single comb and are more prone to frostbite which can be very painful. We got buckeye's for that reason (we are in Ohio). Buckeyes have a pea comb and do very well in all climates. Mine have done great as layers, broody hens, and for meat. I love your blog! I just wanted to add our experience with the Jersey Giants. We absolutely love them and have never had health problems with them. We free range out poultry during the day and put them to bed in the hen house at night. Unfortunately, since they are such large girls, when we get the infrequent coyote visit they are usually the first to be had. They move slower and do not fly as well as the smaller framed breeds. But, they are also too big to easily drag off. So, instead of feathers and missing chickens, we ended up with mortally wounded chickens that had to be butchered. I've kept Jersey Giants for about three years now and I love them. They are big girls though! Every batch I get I always have at least one broody hen and they have never broke an egg yet. They do well in the winter and the summer. I've got the gray and the black Jersey Giants, and they are great birds. I butchered the roosters as they are so big they were doing damage to my non JG hens, but since you plan on keeping them seperate, I don't see a problem. The hawks leave them alone because the JGs are bigger than they are. They are very gentle, but be aware they are docile to the point of stupidity. Their ease of handling, though, makes up for it. Best of luck with them. We've had CC the past 3 years. This is the first year we went to butcher one and found it had "water belly". Read it could be from congenital heart failure, which makes sense since they get so big so fast. Just tossed it in the field and 2 vultures had it gone in an hour. Got great picks of the vultures with my zone lens. You should look into Freedom Rangers. We have had tremendous good luck with them. They grow to 5lbs in 10 weeks easily. We processed some at 13 weeks and they averaged 6.5lbs (some much larger). They are friendly, and ours at 20 weeks have started to lay. Our friend also does them and she said hers is the most consistent layer who continued to produce all winter long. We really live them and will be keeping some from each batch we are doing. They look like something out of a store. Check out freedomrangerhatchery.com we have purchased both the regular and non gmo birds with fine results from both. We were accidentally sent a black freedom ranger in one batch who we kept. He's a rooster and a much different shape then the reds. Taller, leaner... but sweet as pie and nice with the ladies. I highly recommend them! You can see some info about the ones we've raised so far. We did weights on our first batch and kept up with how they grew. Not to bad really. We feed 21% protein and have never had any growing issues either. Boy do they waddle when they run! But they are fantastic for free ranging and keep up with the layers in bug hunting. We are raising about 150 this year.